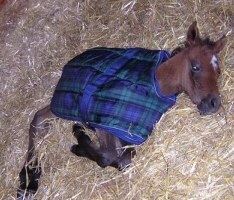 Click on the above book for a great site for foaling questions and pictures. 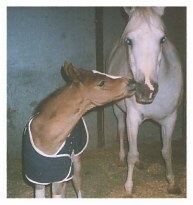 Click on the horses below to go to their baby pictures! 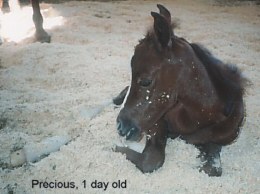 This is a collection of photos of the foals that have touched our lives over the years -- you gotta love those babies. Hi, my name is Hy Komotion (Kalamity). 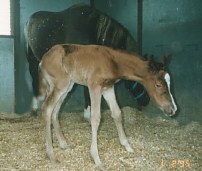 My name came when I was 2 days old. I fell through the pipe fence and was running down the road all by myself! "Help Mom!" got a big kiss from Mom and encouragement to get up! 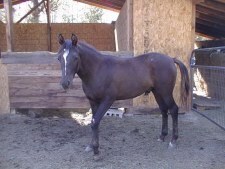 I just seemed to fine things to get into, so "Kalamity" stayed as my "barn name". Here I am in one of my first shows winning a blue ribbon. I was a yearling at this show. (Bold), lived with "Voltage" and they visited the Rockin' "D" and look what happened! 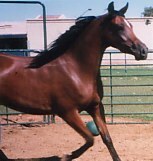 Here I am learning to show in halter -- got my first blue ribbon when I was a weanling. 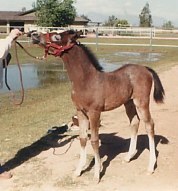 My new owner also showed me in Showmanship when I was about 18 months -- see photo below. I was a birthday present for her! 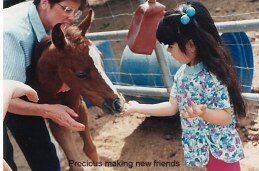 These photos were taken when I was about 4 years old --- wasn't I sweet? 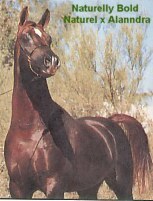 My half-brother is King Kaladdinn (see below) and his daddy is a half-brother to my daddy, "Bold". We are all very close relatives!! 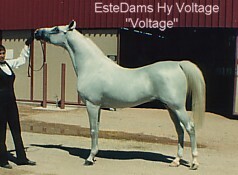 And "Voltage" is my grandpa. Hey Mom, are you awake????? I am built a lot like him. as I tried to get him to play with me!!! I was a "ham" right from the start! And I knew I was going to be athletic! 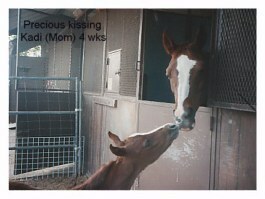 I love you Mom -- here's a big kiss for you! 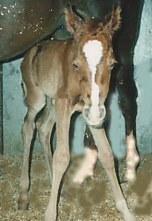 I think I am a pretty big guy at 3 weeks of age! A couple of my pics as I was growing up! I certainly have changed colors a lot! pretty darn proud of me! I was born on your birthday! 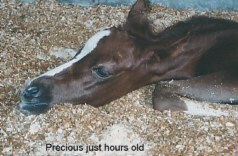 Wasn't I just sooooooooo PRECIOUS -- everyone said how "precious" I was when they saw me and that is how I earned my barn name. 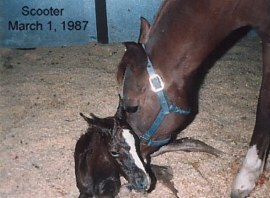 My registered name was because it took me 13 months to arrive and I was Mommy's first girl!!!! 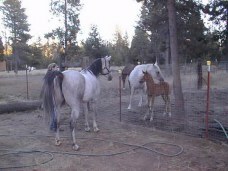 Like all the babies here at the Rockin' D Ranch we do love the kids and the carrots that they bring! We especially loved the kindergarten/preschool field trips because we got lots and lots of carrots! I loved my friend's long hair. I almost ate it when I gave her a "hug". Well, this is me a few years ago. 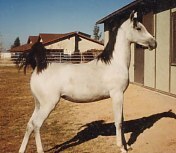 I grew up to be a very pretty horse. 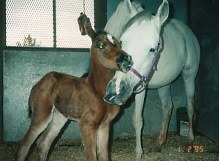 I am almost white now that I am 7 years old and someday I hope to be in the show ring just like daddy! 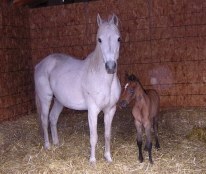 I currently live with my new family at Par Excellence Farms where Aladdinns- Blessing lives (Kaladdinn's daddy). 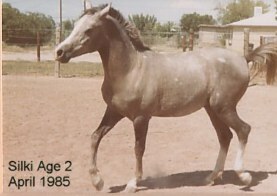 He is a full brother to Precious and as you can see below, he also turned into a beautiful grey! 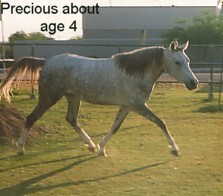 Here he is at 8 weeks of age -- he earned his name because he "scooted" away from Mom and ran across the yard when he was only a few days old -- we were only going a few short steps from the pasture to the pen, but he wanted to explore the rest of the yard -- so much for baby following Mom -- from then on it was a halter and lead rope at all times! 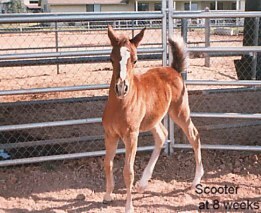 He was Kadi's first foal and was a half-brother to Scooter and Precious -- they were all registered as 7/8 Arabian! 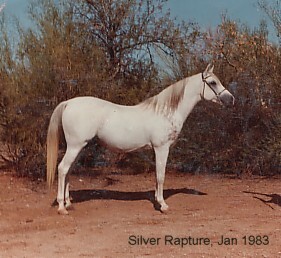 This is "daddy" who lived at Morgan's Arabians in Phoenix, AZ with Trudy Morgan his owner. 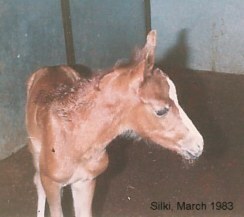 This is Sliki sporting his "mohawk" hair cut. 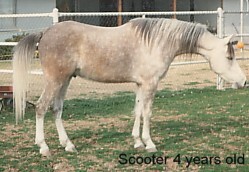 At this time he was living in Phoenix with his new owners and since he loved to rub out his mane, they roached it so it would grow out nice and long. ZA Star Zapphire are my parents. "Ok, I'm here... Is it time for lunch yet? Where is it?" I'm taking a peak at the big wide world, but I feel safe knowing Mom is so close! 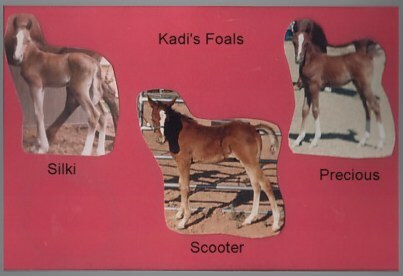 Since I was so sweet and Mom's name is Taffy, I am called "Kandi". ...but they sure didn't slow me down! I soon learned that life is not all fun and games! Now that I am 18 months old I think I know it all... sassin' Mom! 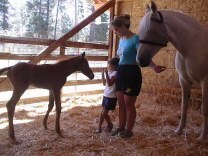 Proud Mom, Codee, showing off her new son to owner Melody and her little friend, Kaeli. Isn't he tall? Hey Mom, who is this? Sunny meeting his full brother, Stormy. 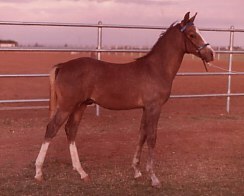 "Naturelly Sunny Daze" a full brother to "Stormy". 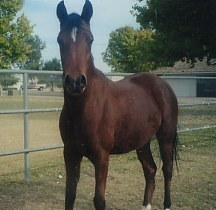 Melody said that the first time we bred to Bold, he had 38 babies on the ground, 37 were Liver Chestnut, 37 were fillies. 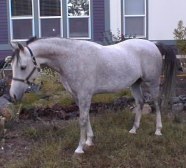 I ended up with a grey colt! We loved "Sunny" so much, and were so impressed with his conformation, intelligence and personality that we bred to Bold again hoping for a liver chestnut filly -- well, "Stormy" didn't quite fulfill the 'filly' part, but they are hoping he will be a beautiful liver chestnut! Congratulation, Melody and Scott on a beautiful baby! 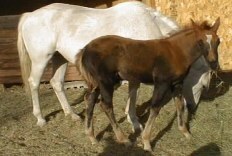 More pictures soon -- He is a perfect miniature of Daddy, Naturelly Bold! 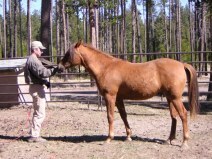 He is a gorgeous liver chestnut with dapples and still has a flaxen tail. 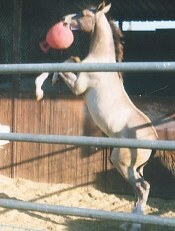 He is probably going to top out at 15.1 or 15.2 -- he is 600 lbs at 7 months! 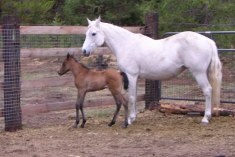 Mom, Codee, should be proud -- after having two colts by Naturelly Bold, she finally gave a very special Easter present to her owners -- nice going Mom! 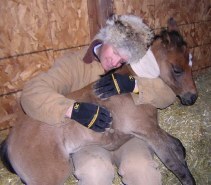 Melody, -- imprinting with a big hug! deserved rest -- will she be grey like her big brother, "Naturelly Sunny Daze"
Mom had a bout with colic and baby had diarrhea so it was off to the hospital -- poor Melody and Scott what a scare they had! Papa Scott loving on Windy while she got her IV fluids -- I would say imprinting was going well!